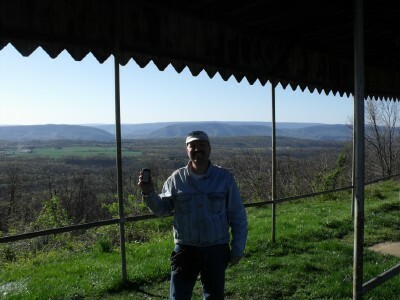 With GeoWoodstock XIII in Boonsboro, Maryland just over 3 months away, this is the first in a series of featured OCNA caches in Western Maryland. The State of Maryland ranks 3rd on our website in number of active caches by State and ranks 4th on our website in activity by State (number of cache searches). Expect some travel tips too; today we even have a lodging recommendation! Above is the view from the Town Hill Overlook along U.S. 40 in Little Orleans, Maryland. At this scenic overlook, which sits at an elevation of approximately 1,660 feet, and has had the title “the beauty spot of Maryland” bestowed upon it, you can see 3 States and 7 Counties. 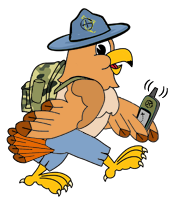 You will also find a Geocaching.com listed cache there, as well as our featured OCNA cache, a virtual, Route 40 – Town Hill Overlook. The cache was created on March 18th, 2012 by cycleangela. We asked how she knew about the overlook and it’s potential for a cache site, to which she replied “When I lived in Maryland, I’d head out to the Western part of the state a couple of times a year to get away. I’d been wanting to take the “scenic” route out, and only knew about the overlook because of signs on the main highway and had done some research on the area. That particular trip, I finally decided to take that route to my destination and got the coordinates and some information for the write up. I decided it was a great opportunity to bring other cachers to the area and at least enjoy the view and learn the history of the area. (There is a GC cache there, but I didn’t know about it until I got there and brought up the app, so that certainly wasn’t the reason for the stop)”. On her cache page, she did her research, and tells us that US 40 is the longest numbered Highway in Maryland (over 200 miles long), and parts of it are the successor to the Historic National Road. Town Hill is a Mountain ridge in the so called “ridge and valley” region of the Appalachian Mountains, which extends from Alabama to New York, and separates the Blue Ridge Mountains from the Allegheny and Cumberland plateaus. 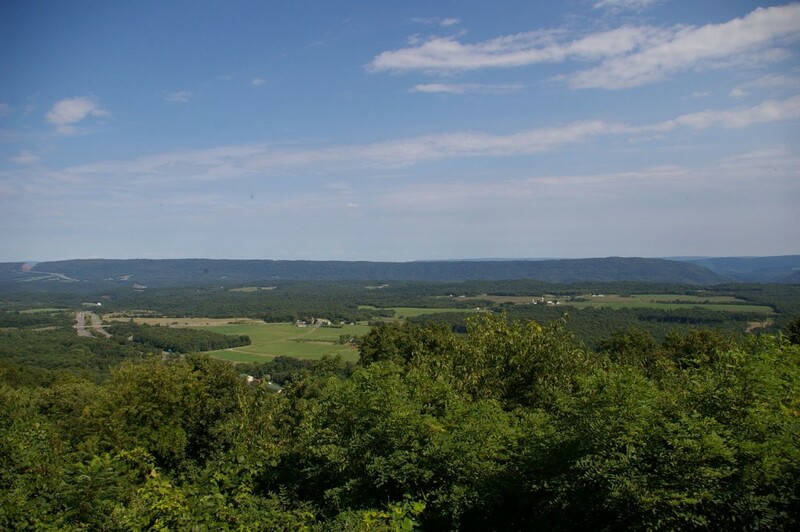 As previously stated, you can see 3 States and 7 Counties from the overlook, although it should be noted Maryland is only about 6 miles wide at that point. 🙂 Should you approach GeoWoodstock from the west, you will drive up and over several of these ridges on Interstates 68 and/or 70. Or maybe you’ll go through them. In the extreme upper left hand corner of the picture at the top of this post (click to enlarge) is the famous Sideling Hill cut for Interstate 68, some 4 miles away. How cool is the Sideling Hill cut? So cool that it has rest areas on both sides of the Interstate, and there is a pedestrian bridge that allows you to visit both sides. And you can find 7 Geocaching.com listed caches there, including 2 EarthCaches and a 2003 placed Virtual. Consider that a teaser, there will be a future blog post on the I-68 Sideling Hill cut. Directly across the street from the overlook is the Historic Town Hill Hotel Bed and Breakfast, which was originally built in 1916 as a fruit stand, but by 1920 had developed into a restaurant and hotel. Not everyone is into the “B&B Thing”, but if you are, you have to read the reviews on Tripadvisor.com; 4.5 stars! Believe us, it is very difficult to get a rating like that on Trip Advisor. There are, lets just say, a lot of grumpy reviewers out there. Take a look at their nicely done website if you’re interested. Keep in mind though, according to Mapquest, it is 45 miles from the B&B and/or the overlook to the site of GeoWoodstock XIII outside of Boonsboro.